Compare prices from several car hire companies in Barcelona Airport and find the best price for car rental. Our prices always include unlimited mileage and insurance. 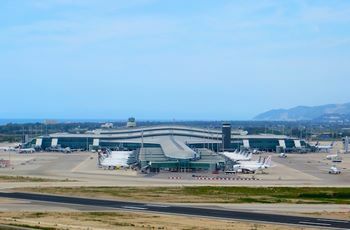 Barcelona Airport (BCN) is located in El Prat de Llobregat, about 15 km south of Barcelona. The train takes approx. 20 to 30 minutes depending on which station you get off on, and it runs both bus and night bus. You arrive at the airport, follow the road C-31 south until you take off at 2B and then follow C-32b. This is the second largest airport after Madrid, and every year, the airport received about 24 million passengers. Many major airlines offer flights from here, including Air France, American Airlines and KLM. From Barcelona you can fly to cities all over the world such as Tel Aviv, Casablanca, Helsinki and New York. At the airport there are car rental, meeting rooms, shops with duty-free, clothing and gifts, bars and restaurants.